No matter how big or small your party or event is, it is certain that there will be rubbish left behind. Therefore, it’s crucial to employ an excellent waste management strategy for your event. Waste management is one of the most crucial but often forgotten steps in planning and organising an event. Now that you’re aware of it, don’t make the same mistake. One way to make that happen is by hiring Lake Macquarie skip bins. Traditionally, skip bins are used in construction, renovation, and cleaning to properly dispose rubbish that come out of these activities. But skip bins remain are useful anywhere and there is rubbish to manage and dispose of. For this reason, it makes perfect sense to hire a Lake Macquarie skip bin for your event. For one, you can keep the environment clean and green while you give your guests a good time. In the end, you get to show the world that you are an organised and environmentally responsible party planner or host. Here are more reasons why you Lake Macquarie skip bins should be present at your next event. 1. Waste collection becomes easier. 2. Skip bins provide that extra space you need to contain all the rubbish. After events like weddings, birthday parties, or any kind of celebrations, there’s so much rubbish to be disposed of. It becomes a problem when you don’t have skip bins present at your event as often the rubbish won’t fit in standard rubbish bins. But if you have the right size skip bin at your Lake Macquarie event, you are assured that it’s enough to hold all the rubbish that needs to be disposed of after the party. 3. Skip bins help your guests realise the value of proper waste disposal. 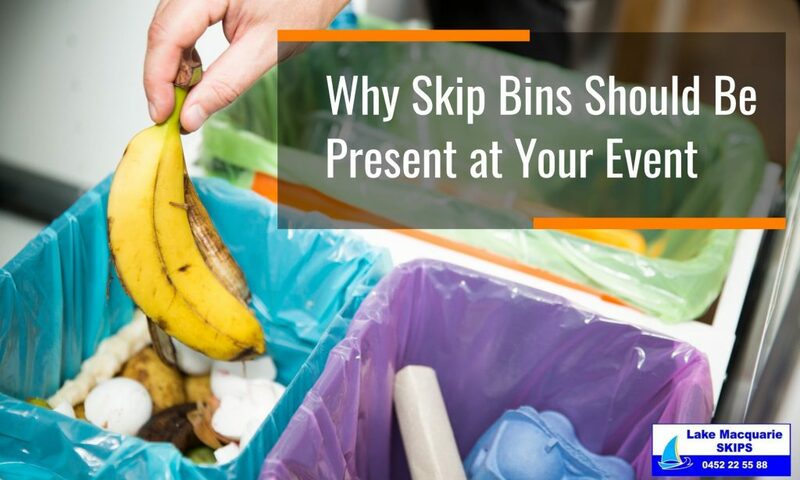 Having a number of skip bins strategically placed in areas where your guests can easily find them and dispose of their waste will allow them to participate in proper waste disposal. When they do, they’ll see its true value, and you’ll be able to influence them to be responsible in dumping their rubbish, with or without anyone looking. 4. Your guests will feel better in general. When you have the skip bins situated in strategic points at your event, the place looks more organised and tidy. It gives your guests the impression that you care about them and their health, causing them to feel better about being present at your event. They immediately recognise that you have everything under control and they can relax and enjoy themselves. 5. Your guests will likely return at your event. Never underestimate the power of word of mouth. When you’ve impressed your guests enough with your event and your excellent waste management skills, they’ll get the good news out to their friends and family. When they do, it means you’ve got more eager attendees the next time you’ll organise an event. Isn’t that amazing? 6. It makes things easier for you. Without skip bins at your event, you’ll have to hire people to manually sort the rubbish for you. You’ll also have to spend more time making trips to the tip until you’re able to dispose of all the rubbish. But since waste removal has become more convenient through skip bin companies, your life as an event organiser has become easier, too. Whether you’re organising a big or small event, Lake Macquarie Skips has a skip bin that will match your unique needs. We have skip bins of various sizes and our expert staff can provide the guidance you need in choosing the right skip bin for your event. Contact us today!